Stouffer’s recently began a line of microwaveable sub sandwiches. They have a couple different varieties, and are actually advertising them comparatively heavily, with TV spots and other multimedia ads. I picked their Meatball Marinara sub, which appears to be the flagship sandwich of the line. The major problem with this sub is that it’s packaged frozen. Being frozen works for things like flatbread sandwiches or hot pockets, but a sub just has too much bread. The ads promise that it “crisps in the microwave”, but it really just gets soggy. The rest of the ingredients are fine. The meatballs are a bit on the small side, but the peppers are actually pretty good for being frozen. Like most boxed sandwiches, it’s not a meal in and of itself, but it could work as a snack. All in all, I wouldn’t particularly recommend this sandwich. If you want a microwaveable sandwich, go with something with more substance and less bread. Sorry for the lack of content this week, check back next week for more sandwich news and reviews!! Time for another store-bought review!! 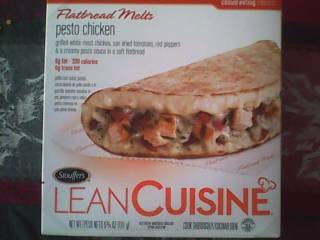 Lean Cuisine is a prepared meal brand which specializes in low calorie meals. They have a number of different kinds of meals, including personal pizzas and pasta dishes. Most importantly, however, they have a line of paninis and flatbread sandwiches. Do something good for yourself!! Also, buy our product!! There are a number of different choices in the Lean Cuisine sandwich line. Most of them involve chicken, a few involve steak, a I didn’t see any vegetarian options. 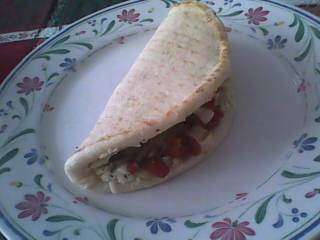 After taking some opinions, I decided to go with the Pesto Chicken flatbread. It was on sale for about $2.50 (at Target, by the by), so it seemed like a good enough choice. Cooking the sandwich was simple enough, it was packaged in the box ready-to-go, and I simply needed to microwave it for a couple minutes, let it dit for a bit, and then fold it over. The sandwich itself was actually a little disappointing. The chicken was fine, but the vegetable choices (sun-dried tomatoes and red peppers) felt uninspired and redundant. The mozzarella cheese didn’t detract from the sandwich any, but neither did it really help, and the pesto sauce was bland. Granted, I prefer pesto closer to how my father prepares it (read: with a ton of garlic), but there wasn’t anything to this sandwich to make it memorable. I wouldn’t throw this sandwich away, but I wouldn’t buy it again either. Overall, I’d give the Pesto Chicken flatbread a B- or so. I didn’t care for it, but the concept of microwavable flatbreads (and paninis) is sound, and some of the other options like Steak, Cheddar, and Mushroom or Southwest Chicken sound like they’re more suited to my tastes anyway. As for price, the sandwiches aren’t too expensive, but they’re not very filling either. They’re more of a snack, or to be eaten with a nice bag of chips or a pickle.